The Tomatis Effect demonstrated that if you change the way the ear works, you affect all the body’s major functions. These changes, in turn, can produce profound transformations in how we function. The ear and nervous system are intricately connected; so, as the ear expands its capacities, the brain also expands its capabilities and states of awareness. 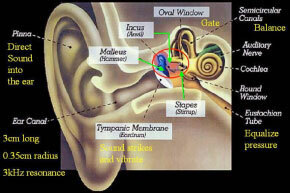 Listening is disturbed when there is a dysfunction of the two muscles located in the middle ear. The role of these muscles is to enable the precise and harmonious integration of acoustic information in the inner ear, and from there to the brain. When the brain is disturbed, it triggers protective mechanisms which inhibit listening.